Today was my first regular storytime since I started this blog. I can barely believe it. I did storytime over the summer, but they were kind of 'greatest hits' storytimes thrown together in a rush. I would normally have started fall storytime a few weeks ago, but our staffing changes took up all my time. But we're back in business now! I usually do 1-3 outreach storytimes a week, plus regular storytime Wednesdays at 10:30. Woe betide any attempts to offer storytime at other days/times in this community! Opening Song: 1,2,3, I Love the Library (lyrics I wrote to tune I learned as a child). ﻿I read this one for three of my four sessions and it was a huge hit every time. 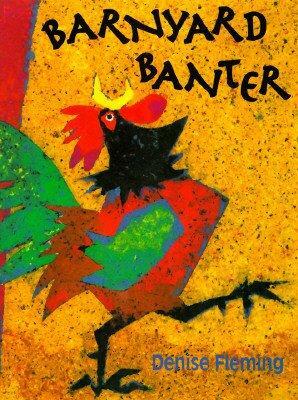 I am trying to be better about saying the titles of the books, and I defined 'banter' for them. When we looked at the title page most of them thought the goose was a duck so we talked about geese and how they have long necks. The kids LOVED spotting the Goose on every page--more than saying the animal noises with me. Song: Old MacDonald (with puppets and barn prop) This is one of my most popular storytime activities, and it deserves its own post--coming soon. Action Activity: I can Jump Jump Jump. 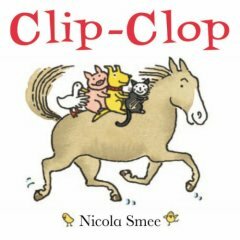 It was rainy here this week, so for the daycares and school groups we did this a few times and varied speed to really get those wiggles out (the source is here, but I've adapted it--we stomp stomp stomp and at the end do it again for show. Repeat all, then sit down slow). Hungry Hen was a big hit with my my school and daycare groups, but I opted out of reading it for regular storytime. The group skewed young and quiet and I didn't think they'd appreciate the twist at the end. 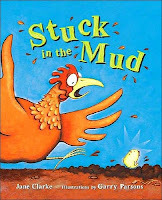 Stuck in the Mud is fun--we all chimed in (more or less) on the refrain he/she pushed and pulled again and again. 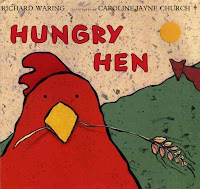 Song: There's a Little Chicken (To the tune of "If You're Happy and You Know it"). I do this song with whatever little stuffed animal or fingerpuppet fits my theme or transition best. It's a good way to build body part vocabulary. "There's a little chicken sitting on my...nose! OH NO! I don't know what to say and then he runs away. Now there's no little chicken on my nose." 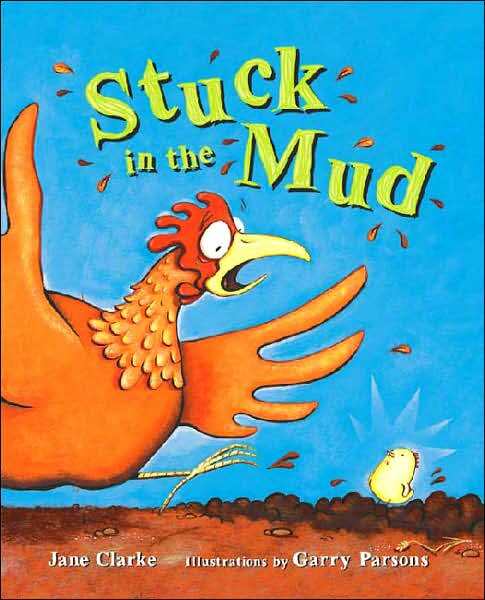 After each verse I have the little chicken pop out from behind my back and pretend that I'm nervous about where he'll go next, which makes the kids laugh and join in. Fingerplay: Here is a Cup. I learned this one from last year's Collaborative Summer Reading Program manual, and it's a new favorite. Pour a cup, and pour a cup (you got this). And have a sip with me"
﻿We start slow and get very fast, ending with a nice looooong drink of tea and rubbing of the belly--YUM! Book: Clip Clop by Nicola Smee or Moo, Moo, Brown Cow! Have you Any Milk? by Phillis Gershator. Flannel Story: Make a Pig. I LOVE this flannel. So much. It's so much fun--the kids just roll with laughter. Fingerplay: My Hands. The version I use is closest to this one here. We read one more book--one of the ones I didn't choose above. For each group I decide on the fly depending on how they're reacting and what I'd like to read. 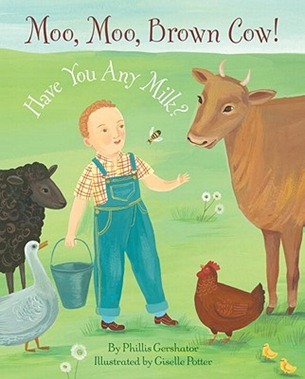 My back up books that I didn't use at all were Margaret Wise Brown's Big Red Barn and Lucy Cousin's Maisy's Morning on the Farm. Closing Song: Storytime is Over Now (Mary had a Little Lamb). Hand Stamps (There would be riots if I forgot this). Craft: I printed a b&w clip art barn onto legal sized paper and there were six animals for the kids to color and glue (precut by my student worker). Easy! Flannel Friday--How do I put it on?